A wonderful late Spring bloom caught my attention during a walk through our neighborhood. 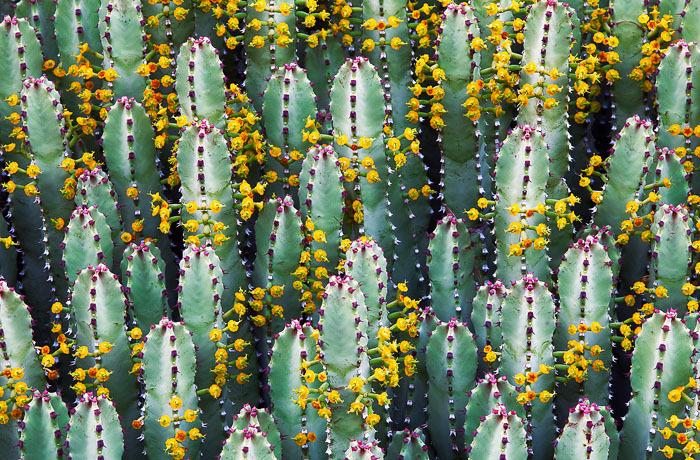 The combination of horizontal and vertical lines on this cactus with prolific colors captivated my attention to this scene. Creative Process: While walking by the scene I was immediately struck by the strong, repeating patterns and colors of the cactus. When I returned the next evening I had a good idea of how I was going to approach the subject. I wanted to capture the “tiers” of cacti layers along with the patterns of flowers. One issue with image capture I was concerned with was the depth of field. Originally, my plan was to blend images to create a better depth of field, but in the end, I was satisfied with the depth of just one image.